A key part of the event is that guests are given a spiritual and a festive welcome. More than 3,500 people in Dublin will get a festive Christmas Dinner on Monday thanks to the Knights of Columbanus and an army of 300 volunteers. About 500 people will enjoy a sit down meal at the RDS, while take-away dinners will be sent out to at least 3,000 people, who are either homeless or in dire financial need. 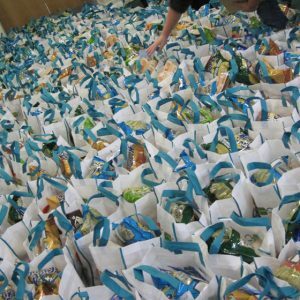 In addition to the dinner, on Christmas morning volunteers will be packing ‘goody bags’ with food, toiletries, soft drinks and household goods that will be provided to the sit-down guests and to those availing of the take-away service. Additionally, three buses have been laid on to pick up people from three city centre locations – Clery’s Clock on O’Connell Street, the Four Courts on Inns Quay, and the Mansion House on Dawson Street – to ferry people to and from the RDS. People will be arriving at the Ballsbridge location from 9.45am onwards and the sit down meal takes place at 11. A key part of the event is that guests are given a spiritual and festive welcome. During the meal, guests are entertained with song, dance and a bit of repartee – this year’s artists include: mezzo-soprano Norah King, Eoghan Cooke and friends, the Bastible Warren Irish Dancers, Slovakian Folk Dancers and a number of surprise artists yet to be announced. Of course, there will also be a bit of a sing-a-long too. Among those attending will be Archbishop Diarmuid Martin and the Lord Mayor of Dublin Cllr Brendan Carr. This is the 93rd year that the Knights of Columbanus have organised the event and steadily the demand for help has increased over the years – in 2011, 1,200 meals were provided; in 2014, 2,500 meals and last year, 3,500 meals were made available. The main reason for organising it is that many of the charities and agencies that assist the homeless every other day of the year are not open, or are only providing a limited service, on Christmas Day. The initiative is supported by a large number of businesses, with food and household goods suppliers donating goods, and donations, via Leydens Wholesalers, who for many years have supported the event. Another major supporter is the Quinn family, with Senator Fergal Quinn, his father Eamonn and his grandfather John being the driving force behind the dinner, which was first held in 1924.